Admit it, you think golf in winter is crazy talk. Only a fool would brave Japanese winters to play golf on a frozen course you say. 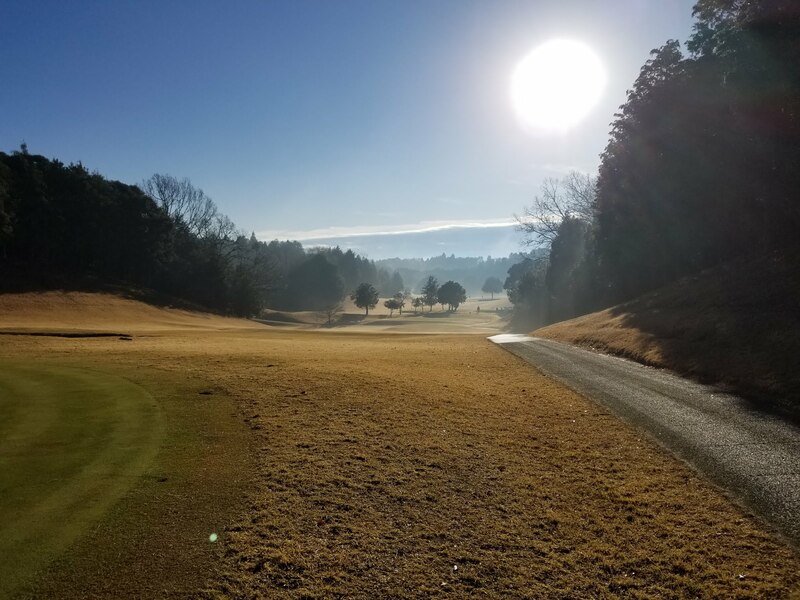 Well, I am here to debunk this myth and explain why golfing in winter in Japan is not only great fun, but equally as enjoyable as any other season. To be fair, Tokyo is nowhere near as cold in winter as people might imagine. Sure, everyone skis in the mountains of close by Niigata and Nagano, but the vast majority of golf courses in and around Tokyo are snow free year round. And aside from a few seasonal adjustments, winter golf is just like golf during any other season. To prove this point, I went golfing during a winter week at 4 separate courses--each with its own special way to handle the winter weather. My week started out at the Narashino King & Queen course in Chiba. It is a fantastic 36 hole course with a wide variety of holes. The King course is long and hilly while the Queen is flatter but sports more water hazards. (We played the King course, which is generally reserved for members. Naturally, we decided to play the blues, a snap decision made in front of 4 waiting carts full of old school members who were scowling at us for holding up their tee times. This was precipitated by one of our playing partners being late to the course. At any rate, the caddy master, who was freaking out, demanded that we tee off without our 3rd member. And so without any warm, on a cold day, my buddy Paul drilled his driver straight down the middle of the fairway. The disgruntled geezer brigade could be heard begrudgingly humming, not entirely convinced the first shot wasn't just luck. I nervously took my utility out, too scared to take the driver, and struck the ball also down the middle of the fairway. The old-timers seemed appeased and didn't complain as we set off.) While the early morning was cold, by mid-day it was beautiful. Result: the hardest part of the day was the first tee pressure! My next round was at Moonlake Ichihara in Chiba, one of my favorite haunts. It's a bit of challenge on the nicest of summer days, but with less foliage in winter, you can actually see the course a bit more. Again, it was fairly cool at tee off, but by lunch, it was almost t-shirt weather. My third course was Murasakizuka in Tochigi. My membership there permits me to get seated at the teppanyaki table despite it being nearly fully booker (shh, secret). It was about -1 degrees at tee-off at 7:13 and was a little windy, but again, by lunch, the sun warmed us up and the 27 holes I played were as enjoyable as any I played during the fall or summer. The hot chocolate at the break stations was a nice touch I might add. The fourth course I went to was Gold Tochigi President. It was a rather busy day for a cold Monday. The fairways were white with frost, which seemed to help the ball roll out a little more. But the greens were frozen, which meant we needed to adjust our game to match the conditions. This day, it warmed up to about 6 degrees but felt warmish in the sun. All in all, after we adjusted to the no-stick greens, we played rather well and go to place through! Wearing more clothing can affect your swing somewhat, but nowhere near as much as rain gear (at least that is what I find). The recommended gear is a knitted hat (more on winter fashion in another article). A long sleeve undershirt, preferably made from materials that breathe, (it’s never good to play with a sweaty shirt in winter). Waterproof shoes are recommended even on sunny days as the dew melts and will give you cold feet if you aren't careful. There is no doubt that many of courses play differently in winter. Without getting too technical, the ball travels less in winter in the air, but depending on the fairways and greens, will roll significantly further. On courses where the greens are frozen in the morning, remember to club way down, or play it like a links course. Aim to chip instead of pitch. On hard greens, high shots can and will bouce like they have hit cement, but putts will roll slower! So keep those thoughts in mind. To counter this, some courses, but not all, will have machines that heat the greens. One of the great advantages of winter golf is that not many people do it, so rounds are much faster. Moreover, because there is less daylight, courses let groups playthrough more frenquently. Of course, less light never stopped me from playing winter night golf! 2. It's cold, but it is still very enjoyable if you survive the first few holes. 3. It is a different game: more clothing, less flexibility, different terrain affects strategy, later start times and earlier finishes mean fast play is important, cold air does affect distance. 4. Where you play in the Tokyo area definitely matters. Course maintenance is also a big element. 5. Hats rock! And more on winter apparel and must-have accessories. 6. In conclusion, fewer people equals more fun! And night winter golf is for the mad.